Residents and authorities of some Italian villages started to see the power of investment in local areas. That’s why they are launching schemes to sell old dwellings to buyers for a symbolic € 1 fee! Can you believe it? And it’s seems like this is a growing trend. Sambuca in Sicily did just that with the aim of rejuvenating its old town centre against depopulation, with some of its inhabitants deciding to donate their property to the Town because they are in need of full renovation. Sambuca is a picturesque hamlet rising on a small hill with views over the Mediterranean island and the nearby beaches. Known as the “City of Splendor”, in 2016 it has been rewarded as the most beautiful hamlet in Italy. Founded by Ancient Greeks and conquered by Saracens, this peaceful retreat is situated in a nature reserve and offers ancient ruins and marvellous scenery. Through the town hall website you can now apply to express your interest in the prequalification process of buying a house for € 1 in Sambuca. It follows the example of other Italian small towns, namely Zungoli in Campania, Lecce nei Marsi in Abruzzo; Salemi, Regalbuto, Gangi and Mussomeli in Sicily as well as Patrica in Lazio. But the list also include Montieri and Fabbriche di Vergemoli in Tuscany, Nulvi and Ollolai in Sardinia where the scheme has already been proven to work perfectly. 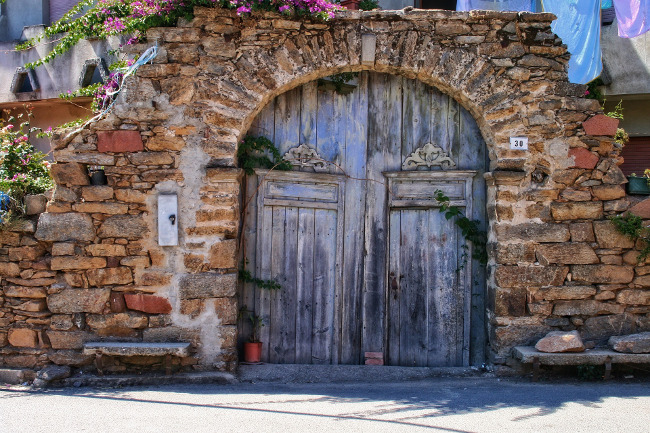 Investors (both Italians and non-Italians) have not only bought dwellings for private use, but have also opened hotels and B&Bs, enabling it to welcome growing numbers of tourists who will be able to enjoy this unspoilt but stunning area of Sardinia. Want to know more about how you can buy one of them? Visit the official website of each town hall. Locals are more than willing to welcome also international investment to enable their old towns to be revitalized and become busier once again. From an home buyer’s point of view, this is excellent news, as it demonstrates the lengths to which residents are prepared to go to ensure the area’s growth and prosperity in the future. The desire of Italian places to prevent depopulation is such that a number of them are selling off property at very low prices to encourage the purchase and the reinstatement of busy centres. With local authorities being so intent on the rejuvenation of the territory, home buyers stand in a very strong position to negotiate and achieve the best prices possible for real estate here, also those that are not included in the € 1 programme. When investing overseas, the importance of choosing a buoyant location is key to making a sound investment for the future. I will travel to Italy this month and I want to now more. Anyway, if you’re looking for an area of Italy in particular let me know and we can put you in contact with some reliable real estate agents that can help you in the research of your ideal home. do you have other areas in Italy were you can buy for 1 Euro & contacts to the mayor? Are there real estate agents who are focusing on 1 Euro Houses you can recommend? If you are interested in one of these towns, you should check the official website of the comune where you’ll find the contacts to ask for more info as it’s the comune who manage directly the sale of these properties. Where is the application I should fill out for the Nului 1 euro house purchase? In case you are interested in one of the other towns, you need to go to the official website of each town where you’ll find the info and the form to fill out. I’m struggling to find the relevant websites to apply for these houses, can you help with links? You can try with this website https://casea1euro.it/ or you can try with the official website of each town (comune). To find them just type “comune di + “the name of each town” on Google. For days I have been contacting one of the sites that represent la comune of Ollolai without success. I am also interesed in the other areas of Lecce Nei Marsi in Abruzzo, Salemi, Regalbuto, Gangi in Sicily, Carrega Ligure in Piedmont. I am a Canadian who also holds EU citizenship. I am not sure if it is already too late to apply for the Ollolai properties, but in any case, do you suggest to contact all other comunes via email then? I look forward to your reply and thank you for your help. Unfortunately for Ollolai the deadline was yesterday. If you are interested in one of the other towns selling property for € 1, you can try and contact them in order to receive info about how you can apply and especially if there are still some property available for € 1 fee. There’s still any house for sale for 1€ , Are it’s to late now? I’m very interested to buy one of those houses and I’m contacting you from norwa. Please help me. tried using the email listed above. did not work, please advise at your convenience if it no longer works or if there is another contact. Do you mean the email for the town of Lecce nei Marsi? If so, there was a mistake. That’s the correct email address: info@comunelecceneimarsi.it Thank you for letting us know, now we have updated it also in the previous comment. I am interested in some 1 euro properties in Italy. Where can i find some properties available in entire italy and at this point?. give me the list of properties and cities available. Can I just confirm that this is a current list of towns offering 1EUR houses? Because all of your other comments say that Ollolai has already stopped accepting applications. Also do you know if the trend of towns offering 1EUR houses is increasing, meaning I can take my time to look around, or decreasing, meaning I shouldn’t be picky with the towns location. Yes, this is the list. Ollolai has already stopped accepting publications, but not sure about the other towns if the also stopped. You could try email them and see what’s going on. In any case this is surely a growing trend, so probably there will be other towns that will adopt this scheme in the future. Io voglio vivere in Italia. I am also interested in the 1€ housing in Abruzzo or other possibilities in mainland Italy. Hallo, dear team of Gate-away… May I ask you…. In Montieri (tuscany) it is province Grosseto or Siena? We like this houses for 1€ and we want more info about houses in Tuscany. Can you send me some contacts for people, who can help us? hi- do you have the contact for homes in Nului and Ollolai in Sardinia? I would like to inquire more information about the houses for 1 euro in Abruzzo part of Italy. I tried to use this email address: inof@comunelecceneimarsi.it however it does not work. Please, could you advice me who to contact? I am really interested in buying one house for the price scheme of 1 Euro in Italy. Could you please help me fill the forms on your website as it is in Italian and I can only write English, please help me fill the forms, kindly contact me on email. I can send all necessary details. We hope it can help you. Do you mean photos of the property for sale at € 1? If so, we think it’s not possible to see in advance photos of those properties. Usually you need to apply for the programme and as new housing units become available, each applicant is contacted by the town hall and invited to see the property so one can decide whether or not to buy the house at a symbolic fee of just € 1. Hello, I was wondering if once you apply for a house if it is guaranteed that you get it or if it’s completely up to the council of that city. Would there be reasons for which you would get denied? If so, what would those be? When you fill out the form, you are simply included in a waiting list of people interested in buying a home for € 1. As new housing units become available, each applicant will be contacted by the town hall in chronological order. Then you can decide if you want to buy one of the houses available or not. Hello, I am interested in purchasing a home for $1 in Gangi, Sicily. Do you have the direct email and any other contact information for the township to start talks with them for purchasing one of their homes? Hello! Can you please tell me if i understand well that for 1 Eu they give me house in certain locations in Italy with contract that I will have to have a plan for a rebuilt the house until 3 years. Are there any houses actually that doesnt need any rebuilt? As I dont have any money. Generally they are all properties in need of restoration. From what I have read on these renovation estimates appear to be between EUR20,000 and 30,000. Do you know if these would generally include labour costs or are they on a DIY basis? That’s hard to tell. It depends on what kind of works you need to do, on the materials used and the company you choose. So you should ask for different quotations to have an idea. I’m interested in buying a house/property in Italy. I am from Italy – but do not speak the language well. So it would be a bit difficult for me to find my way around the market. Can I be contented by mail? Also, if you tell us what kind of property you’re looking for, in which area and what’s your budget, we can forward your request to a couple of reliable real estate agencies working with us that could show you some housing solutions according to your needs and help you in your search. Hello – my husband and I got engaged in Italy and we have loved it ever since. We are very interested in purchasing a home in Italy, and my husband has been researching about the 1$ purchase of a home in need o restoration. We would love to be part of bringing an old property back to life and then having a place to call home in Italy. We understand that word of mouth has gotten this whole trend more popular; with that, we are also aware that some towns may not be participating in this program anymore. We were hoping you could at least direct us as to what towns may still be able to provide this amazing opportunity at this date in time. We know for sure that for Ollolai the deadline was February 2018. You could try to send an email to the other towns listed in this article so they can provide you with further and precise information. I want to know more about purchasing a home in italy ollolai in 79rupees only.. would love to purchase.. Please arrange real estate agents numbers.. Unfortunately the deadline for applying for property for sale at €1 was 7 February, 2018. If de deadline for Ollolai was 7 februar, 2018, Now it is September 2, Can l still apply to de other Places ? You should email the town hall of each village and see what they tell about it. Maybe there are still some chances for some of them. Unfortunately the deadline already expired, so you can no longer apply for houses for sale at € 1 in Ollolai. I am very interested in any of the current opportunities to purchase and revitalize homes in Italy. I’d also be interested in being contacted by real estate agents who specialize in “off the beaten track” character properties either in smaller cities, towns or villages or in the countryside. Budget all-in is <$100,000 and would be happy to spend a good portion of that on renovations. Our goal is to have a home in Italy that we can spend at least 50% of our time at once we retire (in 3-5 years). In the meantime we would use it as a family vacation home. If you tell us which region of Italy could you be mainly interested in, we can forward your request to a couple or reliable real estate agents working in the area. So they can show you some housing solutions according to your needs. Can u send to me the agency contact info . You need to find on the Internet the official page of the town you are interested in and email them. Because these properties are directly managed by the town hall, not agencies. Unfortunately the deadline for applying was 7 February 2018. By purchasing one of those €1 properties and go through all official required processes will I be able to get a permanent resident permit in Italy for me as a Canadian citizen. This sounds very appealing and a project that I can take on. I am wondering what the visa situation is like once you have completed the residence? Hi I’m currently interested in purchasing a property or house in Italy for one euro if they’re still available. All requests received by email will be formed into a database of all interested buyers. You can find a list of properties on the website of the comune. Hi, I am interested in any 1 euro house in any location. I have to say though, if Italy want anyone to follow up on this offer then they need to be more organized. They need to get a grip and coordinate all area’s and publish email links accordingly. At the moment Sambuca di Sicilia is the town still offering property for sale for € 1. Do you have a current list of towns that are offering the 1 Euro homes?? At the moment the Italian town offering property for sale for € 1 is Sambuca di Sicilia. If you are interested and you need further info you have to contact directly the town hall via email. (1 euro) I am interested in home. What are your requirements? I would appreciate it if you give any explanatory information on the subject. not only wants to buy a house, but also wants to live. sir, i like buy house in Italy ollali one euro house please give me detail process . Hi , are there any properties in Italy available presently for 1 euro presently and whats the best way forward to apply for them . Hi my name is Toneisha, I am very interested in buying property for 1 euro. How can I access the application or website ( in English ). I’m American, I’m looking forward to hearing back from you. I am an Indian and wish to purchase a good villa . Please suggest me the schemes proposed by many town hall or villages. Where to contact or how the application will proceed. Try to send an email to the town hall of Zungoli, maybe you can get further info. Unfortunately for the moment we think that there are no other chances to apply for other schemes like this one. Do you know if there are any places still offering 1 € houses?